Camping with kids is an amazing way to bond as a family. As you get away from all the technology and busy tasks of everyday life, you find a better connection. You might thinking, how can I go camping with kids? Where will the kids sleep? After a few camping trips with my infant and toddler, I think I find a way that works. I want to share with you how we do it and hopefully it will help you make your camping experience better! Growing up as a child, my favorite part of camping was star gazing. For my husband it was all about the food. Camping with Kids is not always easy but it does bring the family together. Here are a few things we do to make the adventure a little easier. So you have the air mattress for yourself – now where are your kids going to sleep? This is the most common question I get when camping with kids. Sometimes space is limited depending on the type of tent you have bought. I understand you can’t lug around an unlimited amount of gear. I personally have a two year old and an infant. I wanted my 2 year old daughter to have her own space, but not take up the whole tent. I wanted a safe place for my infant where I wouldn’t worry about rolling over on him. 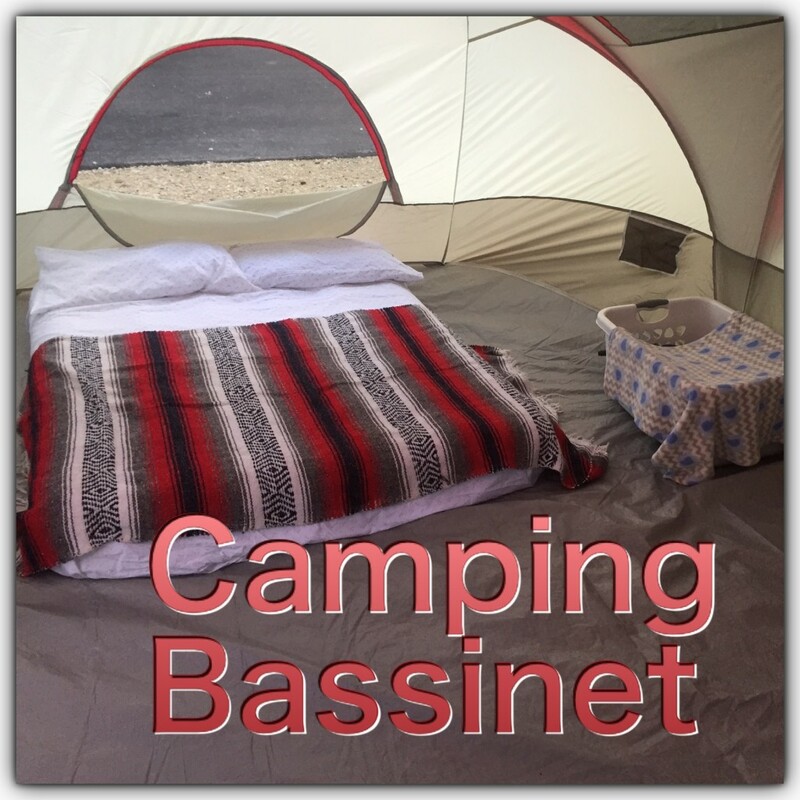 We do a lot of camping with our kids and here is what works for my family. I know this sounds funny, but we bought an inflatable pool float for her. It even has a pillow on one side! In my head I just thought it was essentially the same as an air mattress. It’s filled with air too, right? I just draped a thick cotton sheet over it and a warm camping blanket. She was so thankful and excited to have her own bed! I think this would work well for kids up to 12years old depending on the size of the pool float. Click here to see some inflatable pool floats. This is a game changer for camping with kids. Check out this one! Its durable and it’s less than $10! That’s a great price for a camping “air mattress” bed. wink wink! I packed all of our bedding in a large rectangular plastic laundry basket. I used that laundry basket as a “bassinet” for my baby. (Hey, no mommy judgements, they used to babies in drawers to sleep in the old days!) I put a folded towel and then a soft baby blanket for a “mattress”. In between midnight breast-feedings he slept GREAT! It worked well because it didn’t take up a lot of room in the tent – but it gave him a cushioned & contained place to sleep. He doesn’t sit up yet or roll yet. always use your judgement. If your kids is big enough to roll and tip it or sit up and fall out of it – maybe this ISN’T the option for you. But I want to show you that camping with kids is easy, even with an infant! Here is a basket that is almost exactly like mine. And who doesn’t need another laundry basket in their life? MOSQUITOS!!! They constantly find you and can turn any camping with kids trip into a scratch fest in a matter of minutes! My little ones are so prone to getting bit. They are just so sweet (That’s my explanation!) I have tried literally EVERY product out there. The answer is ThermaCell! My husband has used this mosquito repellant device for years in the woods (he used to hunt) and we never leave home without it! If you are into something more natural, (raises my hand high!) Here is what I use. It is DEET – free and the active ingredients are essential oils. One of the best things about camping can be the food! However BBQs and kids don’t usually mix well! So make sure you have a safe appliance by picking up one of the best charcoal smokers! Try researching some family friendly recipes below you head off. Some yummy ones to try could be smoked pulled pork with tacos or nachos. Both are easy for little hands to assemble and they can help prepare the bowls of toppings, like cheese and lettuce. I want to encourage all families to make time for the great outdoors. Because kids don’t remember their best day of screen time. The truth is, if you start asking around you will find more families are camping than you realized. Don’t get me wrong, every trip can’t be perfect and we have had some adventures that extremely stretch the use of the term adventure. The truth is, we need time together and we need time outdoors. Nature does amazing things for your body and mind. Seek peace and enjoy the outdoors. Go camping with your family. I love camping with kids and traveling. Most all of my travels are documented here on megforit.com and my Instagram. Feel free to take a look around and catch some positive vibes while enjoying the photography of all my travels. Follow my photos on INSTAGRAM. I have seen dog beds used for tiny guys. When my babies were really little we just all slept on the floor. We didn’t go camping much with infants, but we did go on a pretty long road trip when my second son was 4 months old. How creative! I love the idea of maximizing space for your kids to comfortably camp! But dog beds for babies also sound super cute too lol. What an awesome idea! I love the pool float. Sleeping with my son in the same bed is like wrestling with an octopus, so the idea of him having his own little sleep area, without being on the ground is perfect! More than 30 years ago my husband purchased four “cloth” heavy duty inflatable air matresses for me and our three children to use at our local military campsite and beach. Children used them in the water at the beach/lake during the day. The mattresses rinsed easily and dried quickly and we were able to place our sleeping bags on them for nighttime use. All these years later they have been packed for mission trips and camp visits for our church youth group. We pull them out for yearly youth campout on our property and when the teen girls descend on our house for a Friday night get together. That is genius! It is funny how the most simple things often escape us. When my mother in law suggested I just put the crepe batter into an old cooldrink bottle for easy pouring I was stunned. Felt so silly that I had never thought about it. We like making crepes when camping and transporting the batter is always a mission. I LOVE the idea of using the washing basket. Hhmmm sounds interesting. I have actually never been out camping, like never. And I haven’t imagined the possibility of camping with children. But your post made me feel differently hahaha. So it is possible to camp even with kids. Looking forward to my first time camping. like NEVER! Oh girl, you gotta come visit me. I will take you on a fun glamping adventure. You will see how fun it is and how you don’t have to rough it. Thanks Miranda. I hope you found it helpful. Me too Steph! The best memories for me and my family are Disney trips and being outdoors. There is something so reconnecting when you disconnect and spend time outdoors with loved ones. I love camping, too. 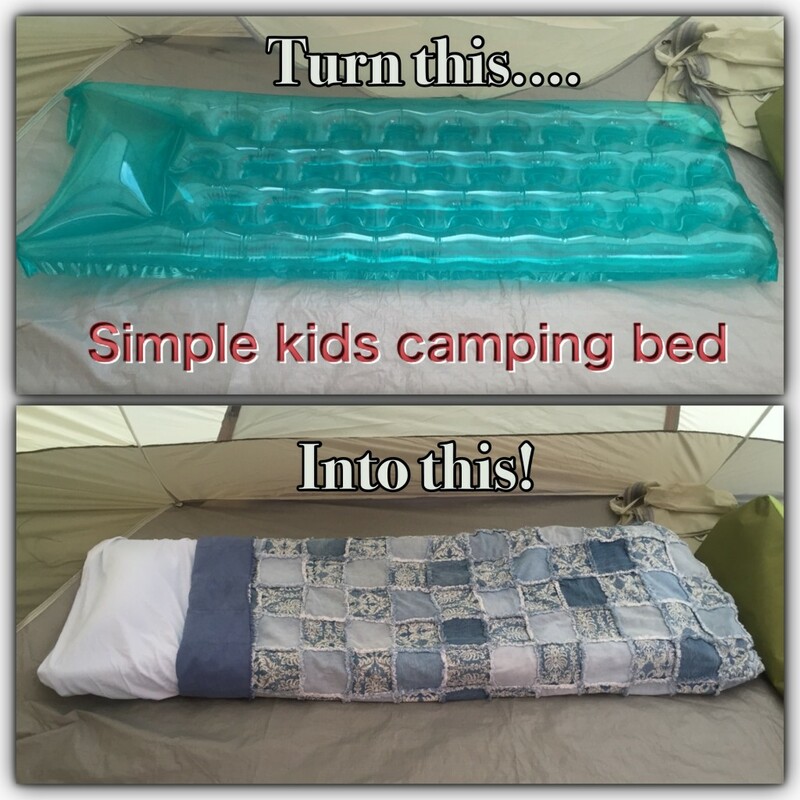 And these are such great tips for camping with kids. It can be easy to go overboard and buy the latest and greatest gear but why not sort out some quick and easy hacks with items you may already have. Awesome post! I didn’t know you were into camping Heather! That is awesome! Where abouts are you camping? Before I got real camping gear, we all slept on pool floats. They worked fine!! No need to spend a fortune when inexpensive products work fine! yeah! It doesn’t take much to have a comfy camping experience. You just have to think outside of the box. I actually wanted to jot down a simple message in order to appreciate you for the awesome guidelines you are giving on this site. My extensive internet investigation has finally been paid with reliable information to exchange with my friends and family. I ‘d admit that many of us readers are really blessed to exist in a fantastic place with very many special people with interesting plans. I feel very much blessed to have encountered your entire web site and look forward to tons of more enjoyable times reading here. Thanks a lot again for a lot of things.